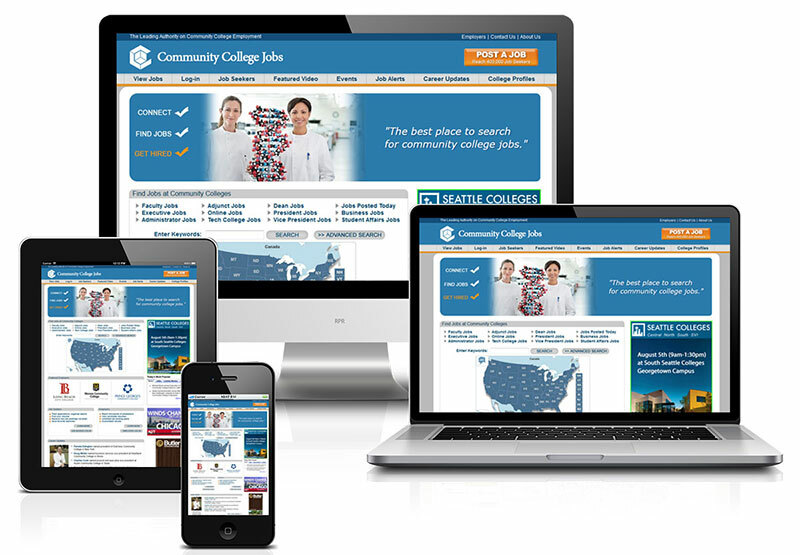 Founded in 2009, CommunityCollegeJobs.com is recognized throughout academia as the #1 website for finding jobs and careers at community colleges. We created CCJobs seven years ago because there needed to be an effective and affordable way for community colleges to recruit high-quality professionals to work on their campuses. Over the years, our website has earned the reputation as the "best place to advertise" for community colleges seeking to recruit and hire top executives, administrators, faculty and staff. Last year, 1,102 colleges in all 50 states advertised 14,826 jobs on CommunityCollegeJobs.com. This year, CommunityCollegeJobs.com is on track to have a record number of job postings, as more HR departments use our website to recruit top professionals to fill important job openings. For employers, CCJobs is the affordable, highly-effective recruitment solution that helps community colleges find and recruit top professors, administrators, chancellors, presidents, adjunct instructors, financial aid officers, and other academic professionals to work at their institutions. For job seekers, CCJobs is the most authoritative source for finding community college employment. More than 200,000 professionals have signed up and created MyCCJobs accounts to find jobs and to easily manage their job searches on our website. The sustained, years-long success of CCJobs stems from the fact that our user-friendly and comprehensive website is designed specifically to make finding great community college jobs easier than ever. CommunityCollegeJobs.com is much more than a job board. Our daily news stories keep professionals up to date with the most important issues facing community colleges, and our daily career updates let you know when friends and colleagues land new jobs. It is widely-known that community colleges are the fastest-growing segment of higher education, and they are among the most important institutions in academia today. For community colleges to operate at optimal levels now and in the years ahead, they will need top professors in their classrooms, the best administrators in their executive offices, and talented staff members working in offices throughout their institutions. That is where CCJobs comes in. We connect employers and job seekers. Each job listed on CommunityCollegeJobs is seen by hundreds of thousands of highly-qualified candidates in all 50 states, and worldwide. Please bookmark CCJobs today and return often. Contact us now to learn how we can help you reach your employment goals. Enjoy the site! For years, CCJobs has partnered with leading organizations in the world of community colleges.